Come summer, watermelon is a must buy fruit in my home. 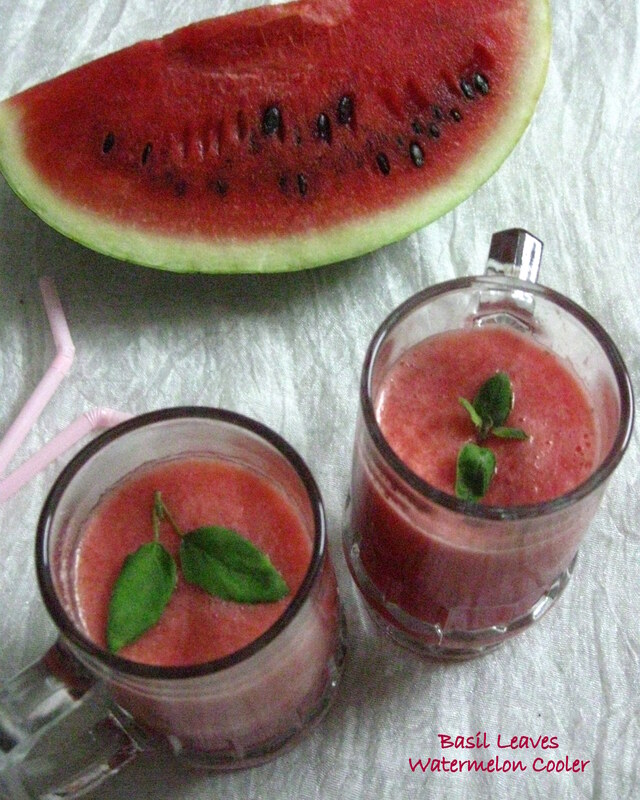 I could have watermelon / Dharpooshani as such or as a juice or cooler or as smoothies. It is a best fruit to beat the heat. During college days, i remember always buying watermelon coolers during breaks, then drinking it and chatting away with my friends. Those were the carefree days! Sigh.. Nevertheless, i always get to have watermelon – be as pieces or as a drink. Yes, watermelon have this specialty of yearning for more and more! Well, there is difference between juices, coolers, smoothies and punch. Although all these drinks are mocktails, they have some slight variations. Juice – is basically a liquid or extract obtained from a fruit or vegetable. Cooler – It has the liquid of a fruit or vegetable plus, soda or lime juice or vodka or some liquor is added. It is some what cocktail – ish in nature. Smoothie – is a thick, smooth drink of fresh fruit puréed with milk, yogurt, or ice cream. Smoothie and milkshake are almost same. A milkshake is a sweet, cold beverage which is usually made from milk, ice cream, or iced milk, and flavorings or sweeteners such as butterscotch, caramel sauce, chocolate sauce, or fruit syrup. Now a different variation of milkshake is Sharjah shake, a very popular drink in Kerala. Punch – It is a wide assortment of drinks, both non-alcoholic and alcoholic. It generally contains a fruit or fruit juice. They are usually red in color, has small fractions of fruit extract or fruit juice and mostly has sugar or corn syrup, citric acid, and artificial flavor. Sharbat or Sherbet is a popular West and South Asian drink that is prepared from fruits or flower petals. It is sweet and served chilled. It can also be served in concentrate form and eaten with a spoon or diluted with water to create the drink. They are mostly made of rose (gulab sharbat), sandalwood, lemon, orange, mango, nannari, pineapple etc. They are commonly found in Indian, Turkish, Arab, Afghan, Pakistan and Bangladeshi homes. Squash is a fruit concentrate or fruit flavored syrup made from fruit juice, water, and sugar or a sugar substitute. They usually have food coloring and additional flavorings. Traditional squashes contain herbal extracts. 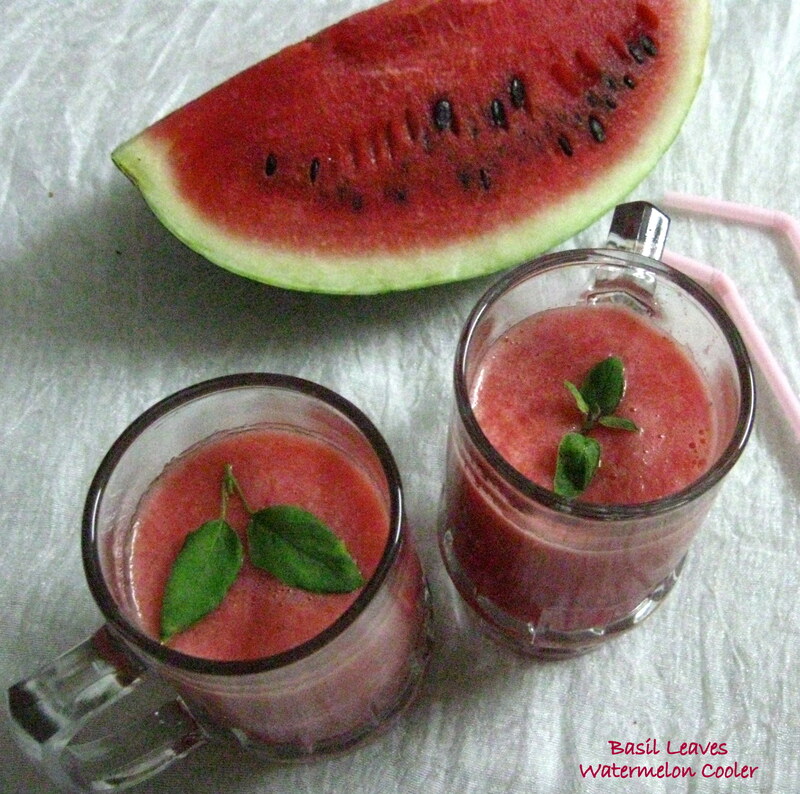 But for now, here goes the Basil Leaves Watermelon Cooler recipe! Blend all the ingredients in a mixer jar. Transfer into glasses and enjoy this refreshing drink!! According to your sweet preference and based on the sweetness of the melon, you may or may not need to add sugar. Taste the melon pieces or blend and then drink to check sweetness. Add sugar only if required. Remove any tough stems from mint leaves or basil leaves before blending the ingredients. If you can’t find basil leaves, you can use regular mint leaves as well. If you want the taste of melon alone, omit lime juice and have it as a simple iced juice. For an exotic garnish, you can freeze basil or mint leaves into ice cubes before serving. Do not preserve this drink. Have it fresh. You may also add, Rose syrup or Roohafza. But i prefer simple watermelon drink. Typical summer drink – love it!! Yes Rose, it is a typical summer drink and just refreshing too!! That sounds and looks really delicious and super refreshing! Yes, it tasted really delicious and refreshing!! Thank you so much 🙂 Watermelon is a favorite fruit for me also!! Wow… Im definitely gonna try this this weekend. In this scorching heat, this would be a life-saver 🙂 Great pick!